Each season has the most popular trends. This back to school season I've noticed the scoop rockers are the most popular seating item of the moment, the mini twistable crayons are the hit gift of back-to-school, the light boxes, and the brag tags are the classroom management tool of this school year! 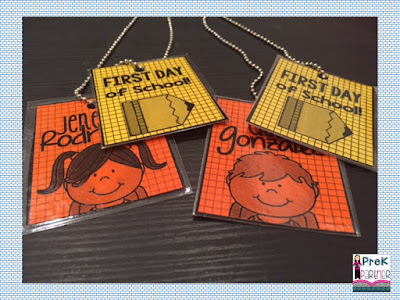 Brag tags are a classroom management system that highlights achievements, celebrates milestones, good character, and academic goals met. After looking and looking for brag tags that would serve my little learners goals I couldn't find one and created my own. For my brag tags I used the CA Learning Foundations Standards that we use in our planning. I tried to include each one of the standards at my students level. 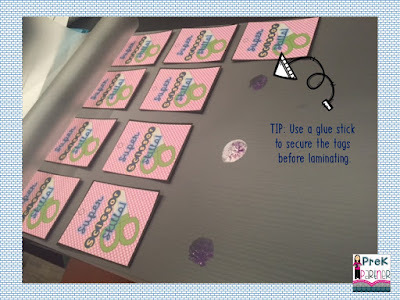 My 100 brag tags are tailored for early childhood educators and their students and their developmental levels and goals. In my classroom brag tags are EARNED! I really look for efforts, good disposition, good character, academic and social achievement in my students for earning the tags. I give them out on Friday and explain the reason they have earned the tag. Some students can earn 1, or, 2, or 3, or none (which I really try to look for opportunities for earning them). The only tags that are given are the fun ones, holidays, birthdays, first and last day, and school events like picture day. These tags were placed in their cubbies for their first day of school! My prepping is a family affair! 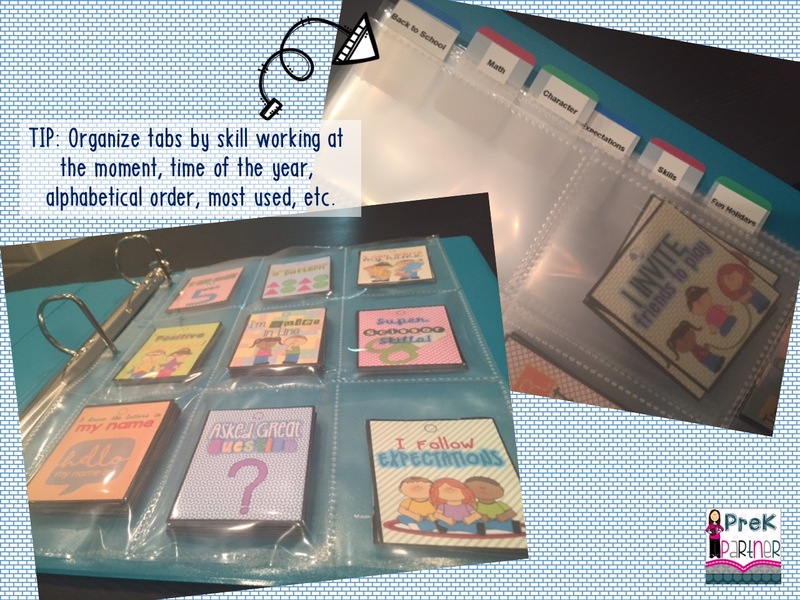 I have my daughters help me cut, laminate, cut again, sort them out, and place them in the binder by category. then I laminate, then I cut (again! ), and then we sort, and sort! Brag tags can be stored in many ways. I've seen them stored in tool boxes, with binder clips, and in binders. 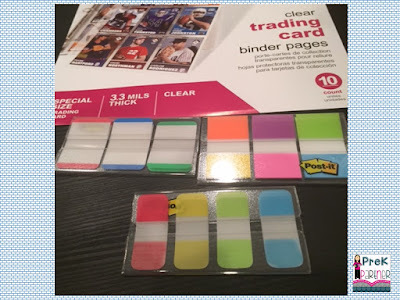 I have tried several methods already, but the one that's working for me is the binder. Using trading cards pages I sort my brag tags. Then I use sticky tabs and create sections that works for me. I prefer to organize my tags by math, language, holidays, skills, and good character. This allows me to quickly pick the tag I'm looking for, and replenish them if I'm running low. I think I can answer these two questions together. 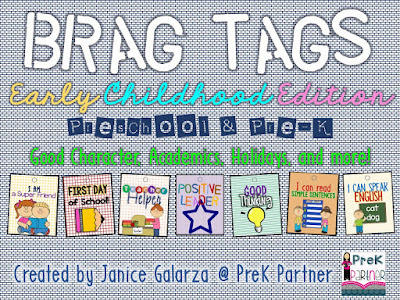 Yes, my students wear the brag tags on Fridays and Yes, they can take them home for the weekend to show them off to their families. They bring them back to school on Monday and put them in their cubbies. Besides using a bead necklace you can use the booklet included in the product. 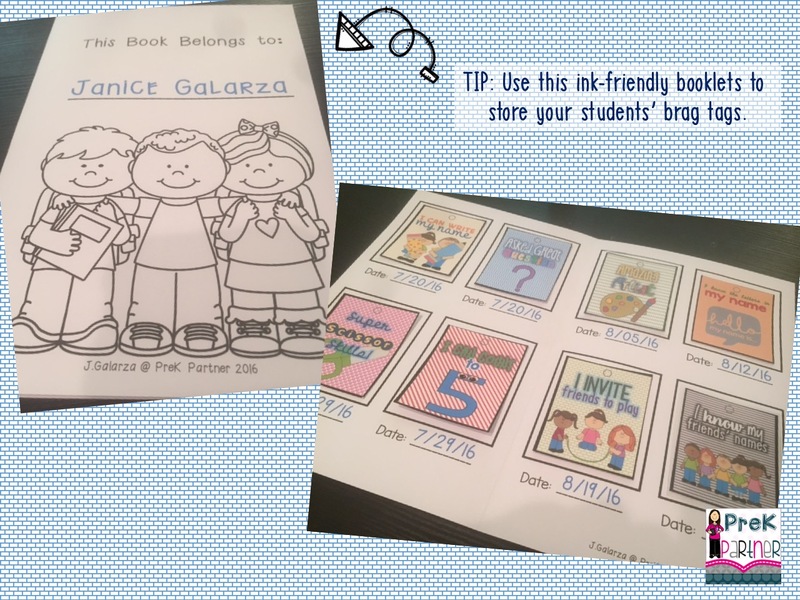 In the booklet (you can choose from 3 templates available), your students can glue the tag onto the book and the teacher can date it. 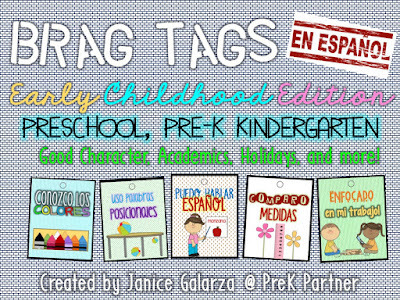 Click on the pictures for English and Spanish Brag Tags! Do you see yourself using this classroom management system?